WASHINGTON — Most young Americans want any health care overhaul under President Donald Trump to look a lot like the Affordable Care Act signed into law by his predecessor, President Barack Obama. But there’s one big exception: A majority of young Americans dislike “Obamacare’s” requirement that all Americans buy insurance or pay a fine. A GenForward poll says a majority of people ages 18 to 30 think the federal government should be responsible for making sure Americans have health insurance. It suggests most young Americans won’t be content with a law offering “access” to coverage, as Trump and Republicans in Congress proposed in doomed legislation they dropped March 24. The Trump administration is talking this week of somehow reviving the legislation. 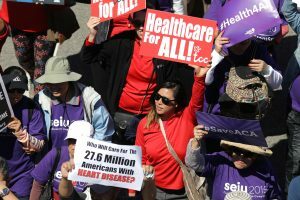 Conducted Feb. 16 through March 6, before the collapse of the GOP bill, the poll shows that 63 percent of young Americans approve of the Obama-era health care law. It did not measure reactions to the Republican proposal. The most popular element of the law is allowing young adults to stay on their parents’ insurance until age 26, which is favored by 75 percent of 18-30 year olds. It’s not just that they personally benefit — an Associated Press-NORC Center for Public Affairs Research poll conducted in January found that provision was equally popular among all adults. That proposal was included in the failed GOP overhaul. But the Republican plan also contained provisions that most young Americans — the racially diverse electorate of the future — do not support, according to the poll. Two-thirds of young people agree with a smaller majority of Americans overall that the government should make sure people have health care coverage. And they understand that will cost more: Sixty-three percent want the government to increase spending to help people afford insurance. Only about a quarter of young people want “Obamacare” repealed. Those feelings cut across racial lines and include most whites, who formed the base of Trump’s political support in the presidential election. GenForward is a survey of adults age 18 to 30 by the Black Youth Project at the University of Chicago with the AP-NORC Center. The poll pays special attention to the voices of young adults of color, highlighting how race and ethnicity shape the opinions of a new generation. Only about a quarter of young people want “Obamacare” repealed. That includes 16 percent of young adults who want it repealed and replaced as Trump has vowed and another 10 percent who want it repealed without a replacement. Just over a third of young whites want to see the law repealed, making them more likely than those of other racial and ethnic groups to say so. Young people are more likely than Americans overall to say the government should make sure people have health care. A recent AP-NORC poll of U.S. adults, conducted during and after the collapse of the GOP proposal, found just 52 percent called it a federal government responsibility to make sure all Americans have coverage. Despite their overall approval of “Obamacare,” young Americans’ views on the law aren’t all rosy. Just a third say the law is working relatively well, while another third think the health care policy has serious problems. About 2 in 10 consider the law to be fatally flawed. The Affordable Care Act withstood a Republican effort to “repeal and replace,” but there are problems with the current law that lawmakers acknowledge need to be addressed. We meet a few Americans who have concerns about Obamacare, then Mary Agnes Carey of Kaiser Health News joins Lisa Desjardins to discuss why affordability is an issue for some. The law’s requirement that all Americans buy insurance or pay a fine is opposed by 54 percent of young people and favored by just 28 percent. On the other hand, 71 percent favor the law’s Medicaid expansion, 66 percent of young adults favor the prohibition on denying people coverage because of a person’s medical history, 65 percent favor requiring insurance plans to cover the full cost of birth control, 63 percent favor requiring most employers to pay a fine if they don’t offer insurance and 53 percent favor paying for benefit increases with higher payroll taxes for higher earners. About a quarter of young adults say they personally have insurance through their parents, while another 1 in 10 have purchased insurance through an exchange. The poll of 1,833 adults age 18-30 was conducted using a sample drawn from the probability-based GenForward panel, which is designed to be representative of the U.S. young adult population. The margin of sampling error for all respondents is plus or minus 4 percentage points. The survey was paid for by the Black Youth Project at the University of Chicago, using grants from the John D. and Catherine T. MacArthur Foundation and the Ford Foundation. READ MORE: Did Obamacare help or hurt you?